There are many bedding ideas for guys that are considered manly. These can include themed bedding and different styles to create a masculine bedroom design. A striped navy blue and crisp white bedding set conveys the nautical theme while being versatile enough to change should another theme be desired. A bedding ensemble in multiple blues and browns with varying grays in a classic nautical pattern can be a good match for a man's bedroom. Some of these choices feature sketched sailboats, anchors, seashells, compasses and/or starfish. A cabin theme is a good masculine bedding choice. Some cabin motifs include bear, moose, deer, trout, canoes, pine cones, pine trees and mountains. You can find several bedding patterns that feature one or more of these motifs, often in alternating rows with stripes or plaids. Die-hard collegiate fans love collecting various paraphernalia featuring their favorite alma mater. These can include sheet sets, comforters and throw pillows. You can find this unique bedding for almost every college and university. Buffalo plaid is a large block pattern that is formed by two colors blending together in squares. There can be two or more colors in the overall pattern. The traditional colors are red and black. A striped plaid can create a stunning bedding look in black and white. Different sizes of plaids are printed in wide vertical stripes alternating from small, medium and large squares. Any guy wanting to honor his clan will appreciate a tartan plaid duvet cover. 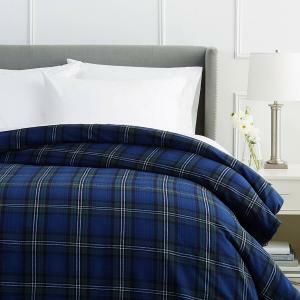 The major clan tartans can usually be found either as a comforter or duvet cover. For example, you may want one of the Blackwatch tartans that features green and blue squares. Matching pillow shams and a few throw pillows in blue and green will make this a good choice. 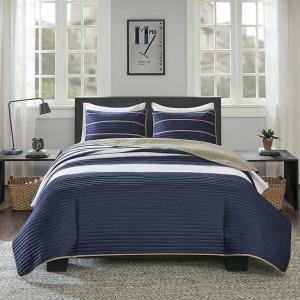 From bold stripes to pinstripes, a striped bedding pattern is always a good bedding style for guys. The color choices are numerous and can be anywhere from two colors to several colors. Many of the comforter choices offer a reversible stripe and solid or two different type of stripes, giving this type of bedding a good dollar-for-dollar value. Add solid colored throw pillows and/or geometric ones to match the colors. A solid color bedding option is easy and doesn't require much planning or thought. You can change it up a little with a different color for the sheets. 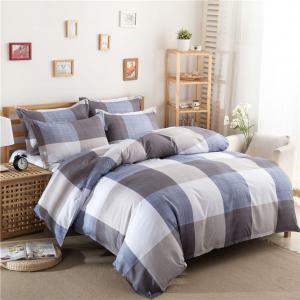 You may decide on a pattern for the sheets, such as a striped or plaid design. A geometric pattern will appeal to most guys interested in engineering, mechanics or science. The patterns in bedding can be found in just about any desired color or color combination. A monochromatic gray in simple rectangle patterns or a more evolved blue and white bandana geometric design are two excellent bedding options. 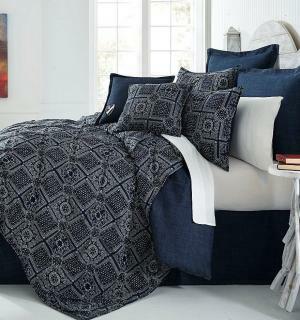 The boutique bedding style is a good choice for guys seeking a sophisticated look. 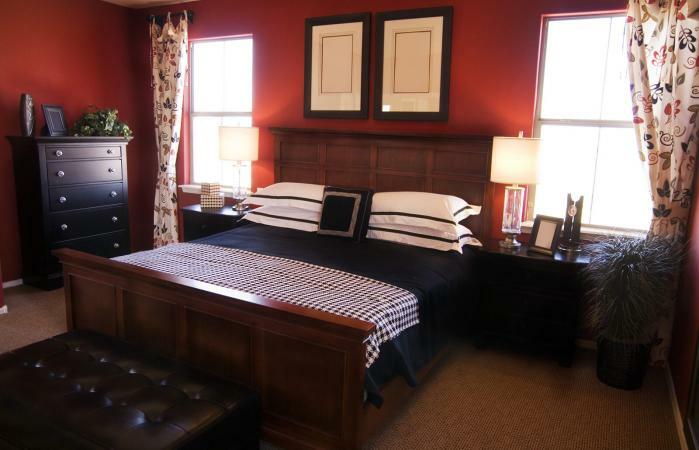 A gray, burgundy and white bedding ensemble with block banding makes a design statement many men will appreciate. Select a bed-in-a-bag set complete with charcoal gray sheets and pillowcases for a complete bedding look. The fabrics for statement pillows can vary from suede or leather to bamboo or cotton. 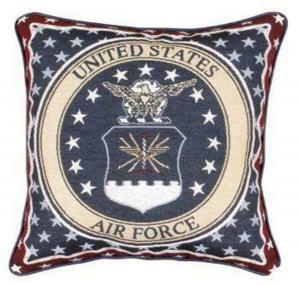 Other statement pillows can transform a plain solid colored, striped or plaid bedding ensemble into a patriotic statement with a pair of tapestry military insignia and/or American flag throw pillows. Support for a favorite college/university or sports team is another favorite pillow option. A bed throw or blanket is another bedding choice that most men will appreciate. 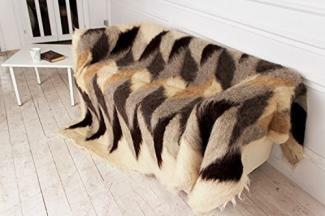 You can select a wool plaid or diamond-shaped pattern featuring various browns and grays with black and white. A solid colored throw or blanket can repeat one of the stripes, plaids or other colors in your bedding. Popular fabric choices include, wool, cotton, polyesters and blends. There are bedding choices available to men from bold to subdued colors and in many styles. The right bedding ensemble will appeal to a man when it features his favorite colors and a style he likes.